Chemical production was mixed over the three-month period. There were gains in the production three-month moving average output trend in plastic resins, organic chemicals, synthetic rubber, coatings, adhesives, pesticides, other specialty chemicals, consumer products and manufactured fibers. These gains were offset by declines in the output of fertilizers, inorganic chemicals and synthetic dyes and pigments. On a three-month-moving average basis, manufacturing activity rose by 0.3% in December, following a 0.1% gain in November. Output expanded in several chemistry-intensive manufacturing industries, including aerospace, machinery, fabricated metal products, computers and electronics, semiconductors, petroleum refining, iron and steel products, foundries, oil and gas extraction, plastic products and furniture. 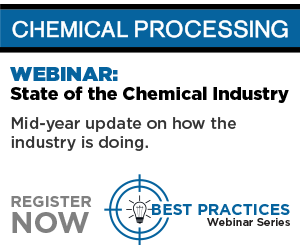 Compared with December 2017, U.S. chemical production rose 2.5% on a year-over-year basis. Chemical production was higher than a year ago in all regions, with the largest gains in the Gulf Coast.